Who Is Ben Ford? Harrison Ford's Son Is A Chef, Author, Adventurer, Craftsman ... The List Goes On! On Thursday evening, breaking news came in that Harrison Ford crashed his plane onto a golf course in Venice, CA. The initial reports said the 72-year-old actor was in critical condition but thankfully, after a LAFD press conference, it was revealed the Star Wars hero is doing fine. In fact, they elucidated that he "suffered basically some moderate trauma.” Then, news got even better. Ford's son took to Twitter to confirm Dad was doing well, writing: "Dad is OK! Battered, but OK." When someone delivers such gosh darn gleeful news as that, it's hard not to want to hug them. But who is Ben Ford? Before I rush to his dad's bedside to deliver bountiful bouquets and inappropriately emotional soliloquies on how much the Ford family means to me, I have to find out more about Ben. Let's start with his Twitter bio. The 47-year-old son of Harrison Ford and Mary Marquardt describes himself as "Husband, Father, Chef, Author, Adventurer, Craftsman, Historian, Alchemist celebrating head 2 tail & root 2 flower." Now, if that's not someone you want to get to know, I don't know who is. Let's learn more about Ben, his career, and what makes him tick shall we? Ben has worked at The Farm Of Beverly Hills, Opus, and Campanile before opening Ford's Filling Station, which opened in 2006 and closed in 2014. Prior to Filling Station, he opened and closed Chadwick in Beverly Hills. 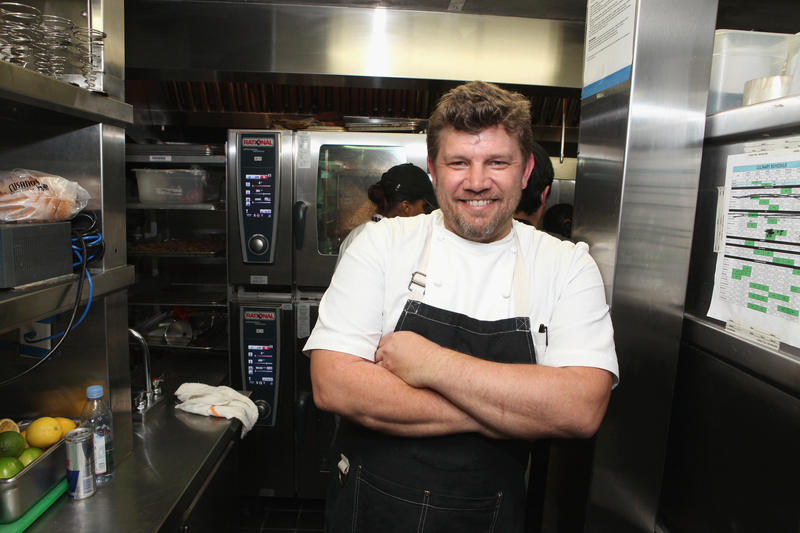 Most recently, Ben was at the South Beach, Miami Food and Wine festival, cooking up a storm. According to Ben's website, he and his wife Emily "encouraged their two sons to put their hands in the soil early on, as it fosters an understanding of the fragility of life, and shows them the connection with food." I bet family dinners are incredible. The Amazon description of his book reads: "The guide to cooking with fire and feeding a crowd, restaurateur Ben Ford gives step-by-step instructions with photos and illustrations so that you can grill, smoke, or roast the whole beast outdoors — or prepare a 'tamed' version of the feast in your home kitchen." It came out in May and people are, uh, eating it up. When Harrison Ford is your dad, it's hard not to be proud, right? No no, Ben. Thank you.